The Hamptons is known as a destination for the ultra affluent, high society and celebrities that flock to the seaside enclave each year for peaceful and relaxing summer getaways. Owning a beach house in the Hamptons has long been regarded as the ultimate in exclusivity. Designed by Leroy Street Studios of New York, the home was conceived of as a house that kind of disappears into the landscape and is a gateway for experiencing the passage from forest to sea. The approach was meant to guide the individual through a sequence of views revealing new perspectives of the house, sky, and water. 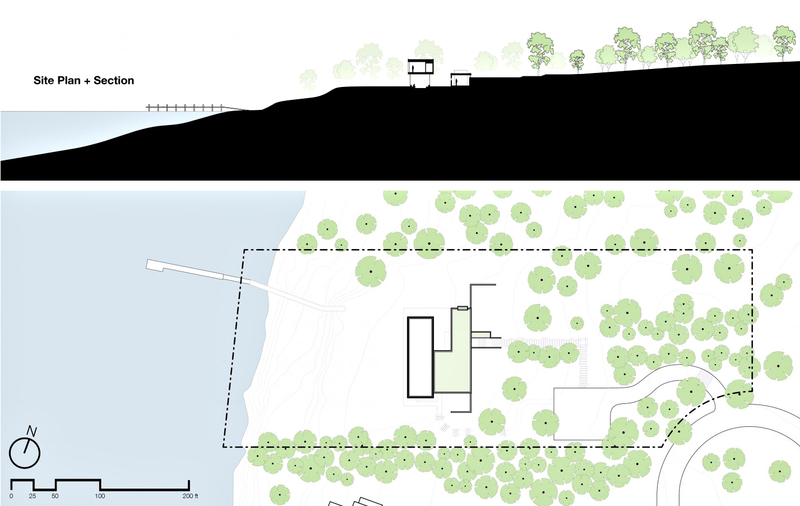 A cut in the earth offers entry to the house, followed by a sequence of interior and exterior spaces that slowly open to sweeping views of the bay. The architecture of the Shore House delivers on the minimalist promise of resisting the urge to add clutter to execute the owner’s inspiration of creating a modern refined living environment that is both unobtrusive and warm.